“Hide Lock Take” and “Hide Your Things, Lock Your Car, and Take Your Keys” is the intellectual property of HideLockTake.com and protected under United States Patent and Trademark Office Registration Number 4224607. Use of this property or variations similar to this property are strictly prohibited unless approved or otherwise given licensing by a HideLockTake.com official. Profit from materials that feature Hide Lock Take branding made without consent of a HideLockTake officials will result in penalties of one, more or all of the following: losses, infringement, and court costs. 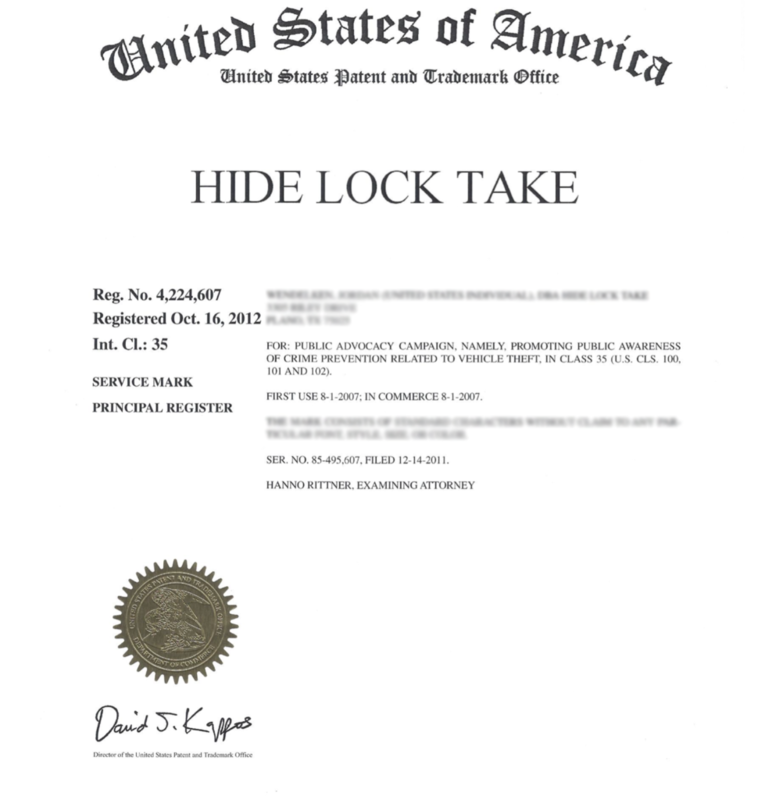 HideLockTake.com is the official and only registered trademark program that can use the Hide Lock Take messaging, design, and branding without consent. We are proud of what our program has become and grown into over the many years. Due to the protection of the brand, its success has since made its way across the United States and beyond. In the past there has been variations of the program and its materials that have placed a poor perceived value in the eyes of the citizens. Because of this, there have been a small amount of cases where the police departments and/or other organizations received negative feedback. Our original intention and designs are to promote public awareness in order to combat against the growing number of auto burglaries. In order to fulfill this we have protected the program and its integrity. Only verified entities can produce Hide Lock Take materials that feature the Hide Lock Take information and can only be certified by Hide Lock Take. Proper documentation must be assigned to those certified. Documentation assigning entities to cease the production of such Hide Lock Take materials must do so immediately. If you are a business or an organization wishing to produce or otherwise distribute HLT program materials we ask you to contact us for the release to do so. We offer many groups the ability royalty free and without fee to go on with production. Please contact HLT for proper documentation.